The hail storm that hit Sydney late last year made a lot of headlines, but has not changed our fundamental view that insurance is an attractive sector in the current environment. Losses from weather events are part and parcel of running an insurance business. While they introduce profit volatility and can have some flow-on impacts, we believe the major insurers are in a strong position to mitigate and offset these factors. The Insurance Council of Australia’s latest estimate is that this event will cost the insurance industry $673m. Our analysis suggests the cost could eventually reach $1.5-2.0bn once all claims are reported and paid, which would make it one of the top five most expensive weather events of the past 30 years and possibly the most damaging hail storm since the Sydney hail storm in 1999. Source: Insurance Council of Australia, Firetrail Investments. Notes (1) Red bar indicates Firetrail estimate of ultimate losses from Dec-18 Sydney hail storm. Most recent estimate from Insurance Council of Australia is $673m. 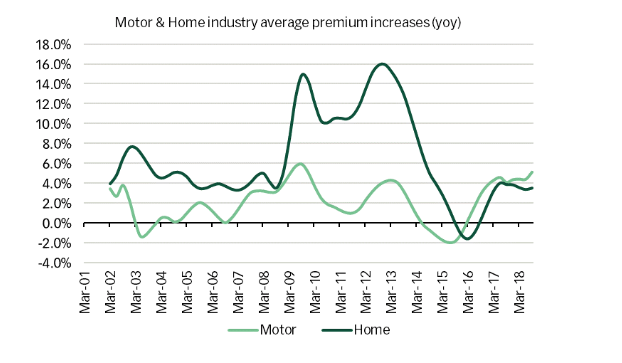 With 60-70% combined share of the NSW Motor and Home markets, at face value such an event could be disastrous for IAG’s and Suncorp’s FY19 profits. Both however, have very strong levels of protection which restrict losses and pass the excess on to reinsurers. The net costs of this event are capped at $169m for IAG and $250m for Suncorp, despite the gross cost likely being multiples of this amount. Both insurers also have allowances in their guidance for a “normal” level of total weather losses in any given year. While the Sydney event does increase the chance that IAG and Suncorp exceed these allowances in FY19, both also have covers in place that provide protection if claims from multiple weather events over a 12-month period begin to add up. The combination of various reinsurance protections mitigates a substantial proportion of the direct costs of the hail storm. We believe indirect impacts are more relevant for ongoing profitability. The price IAG and Suncorp pay for reinsurance would normally be expected to rise following large claim events, but over the years both have shown a strong ability to negotiate reasonably attractive terms. Most recently, IAG renewed its reinsurance program for 2019 at “relatively flat” rates, despite incurring losses on its 2018 program. The ability of IAG and Suncorp to obtain favourable terms can be attributed to the significant surplus capacity that exists in global reinsurance markets, IAG’s and Suncorp’s position as two of the largest reinsurance purchasers in the world, and the attractiveness of Australia as a source of diversification for global reinsurers. The high number of repairs needed in a short space of time after a weather event can place insurer supply chains under strain. Following a hail storm, motor repairer capacity typically becomes stretched and costs are pushed higher. While any claims blow-outs from the hail storm should be covered by reinsurers, it is inflation in the day-to-day claims over the following six months that can put pressure on IAG and Suncorp. The indirect impacts from higher reinsurance costs and supply chain inflation tend to affect all insurers, which typically drives a pricing response across the industry (albeit sometimes with a lag). Following a run of large weather events in 2010/11, Home & Contents pricing increased by 10%+ pa for 3-4 years. Given reasonably rational Motor and Home markets currently, we believe there is a case for recent price increases to continue or perhaps accelerate. Stepping back from the noise of weather claims, one storm that insurers are well positioned to navigate is the current weakness in the housing market and Aussie consumer. While affordability pressures can have some impact, demand tends to be reasonably resilient given the nature of insurance products as mitigants of cash flow and asset risk. Insurers have typically outperformed relative to the ASX200 during more bearish periods for markets and/or the economy. 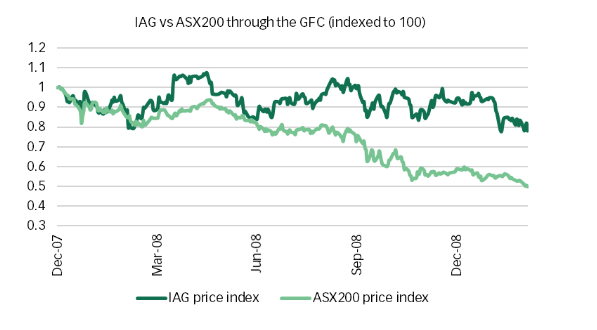 The chart below highlights how IAG and the ASX200 performed through the GFC. While the GFC is an extreme example, it illustrates the value the market places on the defensiveness of insurance in tougher times. We believe this is an attractive feature against the current consumer backdrop. The risk insurers face from large weather events will always be a key talking point for investors, but IAG and Suncorp have shown an ability to successfully mitigate a large portion of the P&L and capital volatility through reinsurance and re-pricing. With defensive characteristics in an increasingly difficult economic environment, we believe domestic insurance represents an attractive sector to be exposed to. For further insights from the team at Firetrail Investments, please visit our website. Firetrail Investments Pty Limited ABN 98 622 377 913 (‘Firetrail’), Corporate Authorised Representative (No. 1261372) of Pinnacle Investment Management Limited ABN 66 109 659 109 AFSL 322140. Any opinions or forecasts reflect the judgment and assumptions of Firetrail and its representatives on the basis of information at the date of publication and may later change without notice. Any projections contained in this article are estimates only and may not be realised in the future. The information is not intended as a securities recommendation or statement of opinion intended to influence a person or persons in making a decision in relation to investment. This communication is for general information only. It has been prepared without taking account of any person’s objectives, financial situation or needs. Any persons relying on this information should obtain professional advice relevant to their particular circumstances, needs and investment objectives. Past performance is not a reliable indicator of future performance. Interests in the Firetrail Absolute Return Fund (ARSN 624 135 879) and Firetrail Australian High Conviction Fund (ARSN 624 136 045) (‘Funds’) are issued by Pinnacle Fund Services Limited ABN 29 082 494 362 AFSL 238371. Pinnacle Fund Services Limited is not licensed to provide financial product advice. A copy of the most recent Product Disclosure Statement (‘PDS’) of the Funds can be located at www.firetrailinvest.com You should consider the current PDS in its entirety and consult your financial adviser before making an investment decision. Pinnacle Fund Services Limited and Firetrail believe the information contained in this communication is reliable, however its accuracy, reliability or completeness is not guaranteed and persons relying on this information do so at their own risk. Subject to any liability which cannot be excluded under the relevant laws, Firetrail and Pinnacle Fund Services Limited disclaim all liability to any person relying on the information contained in this communication in respect of any loss or damage (including consequential loss or damage), however caused, which may be suffered or arise directly or indirectly in respect of such information. i have seen a number of articles on livewire recently commenting on insurers being a good bet in the current environment. simplistically, insurers make money from policy revenue> payouts and operating costs, but also from investing the premiums and earning a return on this. 2 comments therefore: 1. improvements in the 'combined ratio' (ie how good the insurer is at insuring) are typically vastly outweighed by worsening of investment performance when markets go down. i would certainly hypothesise at the moment that the downside of investment risk outweighs the upside of profit improvements from an improving CR. 2. when the world trade centre went down, i was involved with looking at every insurer in australia to see which would survive and which wouldnt. the main outcome of this bit of work was that insurer's publicly available accounts are so opaque that they are essentially useless. punters (and in fact auditors and insurance industry professionals) cannot tell what is on/off balance sheet, what the re-insurance arrangements are (or even who they are with! ), what investments are being held etc etc. investing in insurers therefore has extremely high 'information risk' and makes them very high risk investments. Thanks Mr T. Insurance is an inherently volatile business with reasonably opaque disclosures. However, these characteristics are already reflected in the valuations of stocks like IAG and SUN, which is one of the reasons why they don’t trade at similar multiples to other oligopolistic industries like supermarkets. Our current view is that when comparing the insurance sector to the ASX200, we believe it is in a relatively more attractive position than it has been historically given a stronger revenue and earnings growth outlook than many other sectors in the market. It is true that we will see some mark-to-market investment losses on the equity and corporate bond portfolios of IAG and SUN at the upcoming results. However the ongoing profitability of the insurance business is to a large extent protected by the fact that both insurers match the duration of their bond portfolios to the duration of their claims liabilities, so that interest rate movements have similar impacts on both sides of the balance sheet. Management disclosures on investment portfolios have also improved markedly over the past decade so we at least have some information on the split of investments across asset classes and credit rating bands.